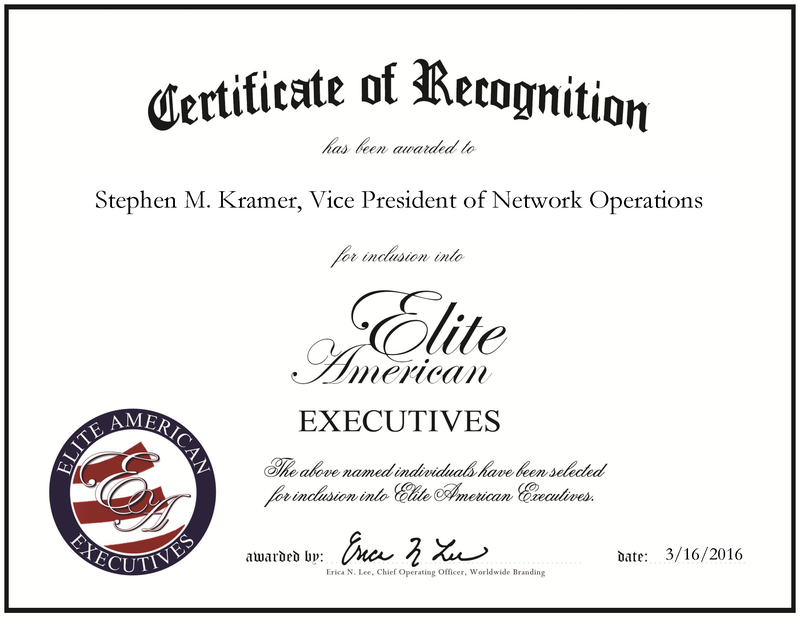 Douglaston, NY, March 16, 2016, Stephen Kramer, Vice President of Network Operations at Cablevision Systems Corporation, has been recognized by Elite American Executives, for dedication, achievement and leadership in cable technology and high-speed data. With a background in electrical engineering, Mr. Kramer is well-suited for his position at Cablevision Systems Corporation as the vice president of network operations. For the past three years in this role, he has been tasked with overseeing operations, team development and communications impact for the team and customers. In addition, he handles network architecture, presentations, forecasting, strategy, tracking and monitoring. Looking toward the future, Mr. Kramer has big plans for continued growth, and aspires to take on more responsibilities, and grow security operations within the company and empower the team. While at Stony Brook University attaining a Bachelor of Science in electrical engineering, Mr. Kramer became involved in computer networking. From this position, he was recruited by Cabletron Systems are a project coordinator, where he designed, drew and worked on network engineering. Climbing his way to the vice president of operations position, his affiliation with the Society of Cable Telecommunications Engineers Inc., the National Cable & Telecommunications Association and the Cable Television Laboratories, Inc. have aided his growth. In addition to his drive for results and meeting challenges, Mr. Kramer is an inventor and holds the U.S. Patent for Method and System for Redirecting Networked Traffic. This entry was posted in Communications, Engineering, Telecommunications and tagged cable, electrical engineering, network, operations management, technology, Telecommunications. Bookmark the permalink.